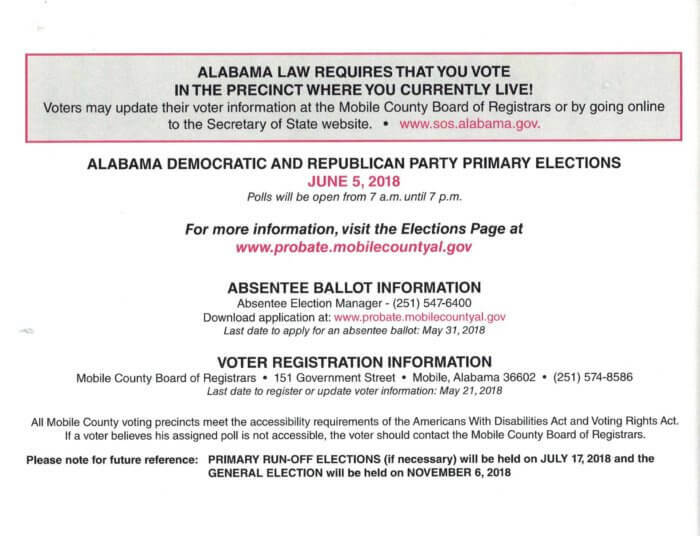 With a statewide primary election approaching June 5, Probate Judge Don Davis is making extra efforts to ensure every vote in Mobile County is counted and cast at the correct precinct. The chance for confusion could be elevated this cycle with newly redrawn lines in House District 97 and some polling centers changing location. 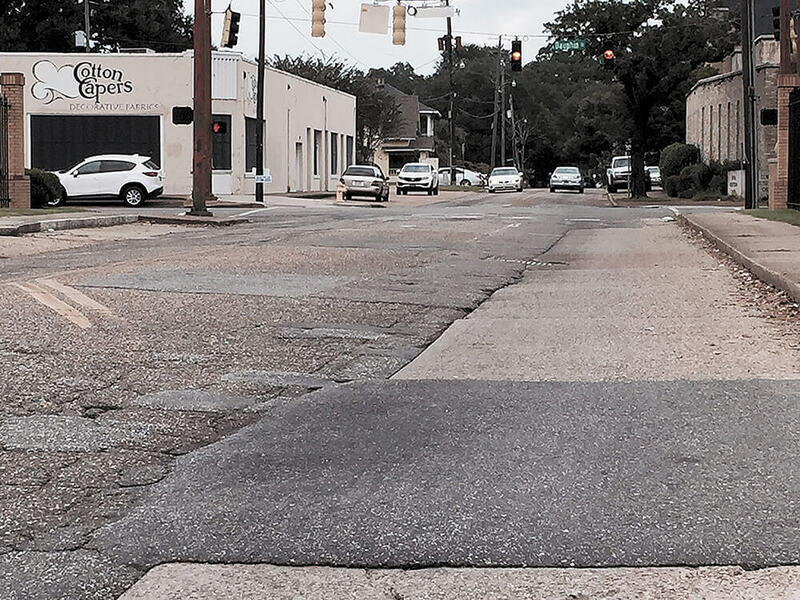 It’s one of the reasons the Mobile County Commission agreed to take extra steps to get the proper information out to voters. This week, the county will begin sending out postcards to all registered voters, whether active or inactive, as a reminder of the June 5 primaries and to help identify the elections they should be voting in and their appropriate polling location. Davis said it’s imperative the electorate have that information to avoid problems on election day. 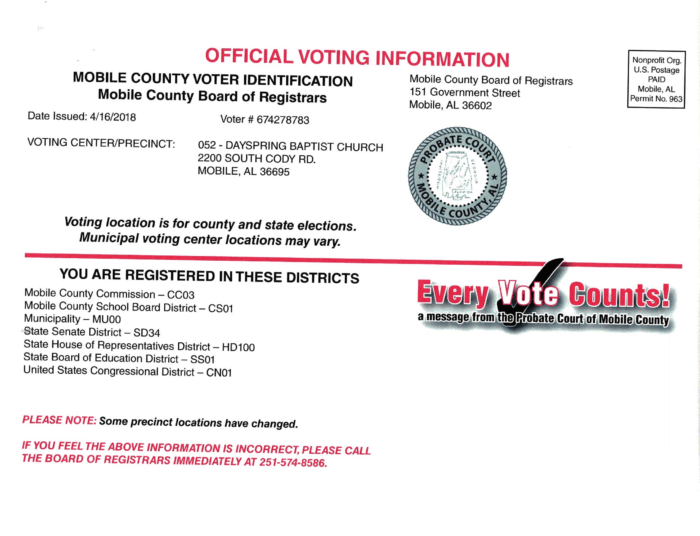 The “vote where you live” concept is not at all new and was particularly highlighted in the 2012 presidential election after the Mobile Press-Register sent out 20,000 voter postcards on the county’s behalf to addresses not based on the county’s list of registered voters. As a result, thousands of voters were thought to have possibly cast ballots at the wrong precinct. At the time, Davis asked the courts to decide whether votes cast outside of an elector’s precinct were valid, and the Alabama Supreme Court ultimately concluded they were not after two years of back and forth litigation between Davis and the Secretary of State’s office in Montgomery. It may not make a difference for at-large positions, but Davis said districted elections — especially smaller ones — can be skewed by a just a few votes. He also said it’s not uncommon for someone who’s moved from a district but remains on the voter rolls there to continue voting in that district. “Somewhere in this county we come across that every single election day,” he added. Mark Erwin, Davis’ chief of staff, offered the race for Alabama House District 99 as an example of one that could be affected by even a few improper votes. With eight candidates in the contested Democratic primary, he said it’s important every vote count and be counted correctly. “There’s a fundamental issue of fairness raised when you consider people who have moved from District 99 to another part of town but maintain their voter registration, and then drive in on election day to vote for a representative who will ultimately not represent them,” Erwin said. Erwin said poll workers try to ensure voters are at the right precinct when they arrive on election day, but they can also be limited by what the law allows them to do. For instance, workers cannot ask a voter where they live unless their ID shows a different address than what’s on the voter rolls, and even when a question is raised, it’s often up to the voter to tell the truth. For those who do show up at the wrong precinct, there is a process to get them to the correct location. Once there, they can fill out a provisional ballot and update their voter registration information for the next election. If everything checks out, those votes count as any other would. However, if someone insists on voting in the wrong precinct, they can fill out a provisional ballot there but, Davis said, those would almost certainly not be counted in the final tally. Davis said one of the tools poll workers use to ensure accuracy is the identification voters present at the polls, which has been a requirement since 2014. Yet what some see as enforcing the law, others view as barriers to a fundamental right — a difference often rooted in politics. Davis, a Republican, said there are “no political considerations” behind the voting procedures used in Mobile County, but during a candidates’ meeting last week, a few Democratic legislators raised concerns about the level of scrutiny some voters receive when they show up to local polls. Under Alabama’s voter ID law, approved forms of identification don’t have to include a date of birth or an address, which is why college ID cards with a name and photograph are accepted. However, the most commonly used form of ID — a state driver’s license — includes both, and Davis said poll workers are instructed to compare that information with the list of registered voters on election day to determine if someone is voting legally and in the right precinct. No matter the intent, Sen. Vivian Figures (D-Mobile) told Davis she questions the use of two sets of standards and specifically noted state law doesn’t require the extra verification. Rep. Adline Clarke (D-Mobile) also raised concerns about policies that prevent voters who already have a driver’s license from obtaining the free “Voter ID” cards provided by the Alabama Secretary of State’s office because of the cost of getting a license renewed. 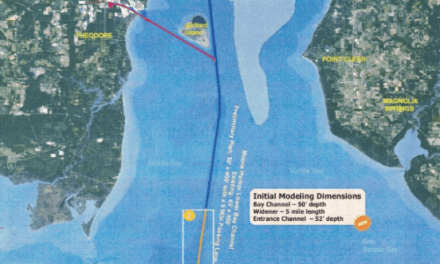 Clarke’s district recently saw its lines redrawn, which is one of the reasons the county sent out voter information on postcards for the first time in six years. Clarke said she hopes the notifications emphasize how many people might be affected by the redrawing of District 97. Davis’ office said it was unable to confirm exactly how many voters in precincts would be impacted at this time. A sample of the postcard voters will receive this month can be viewed below. Registered voters can also find their polling place through the Secretary of State’s website at myinfo.alabamavotes.gov.